1What is the exchange student program? Exchange Student Program is a program that allows students study abroad at partner universities for one or two semesters. Credits earned abroad may be transferred to your transcript following the relevant processes. The specificities of the plans for exchange between SNU and the partner university are discussed and concluded on an yearly basis. 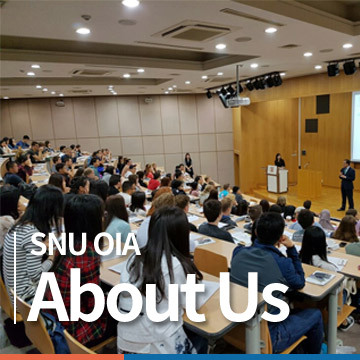 SNU’s policy is to maintain a balance between the number of inbound and outbound exchange students with the partner institution. SNU’s students, in their status as exchange students to the partner institution cannot earn a degree at that host university. If the student wishes to continue study at the host university even after the exchange period comes to a completion, then the student must newly apply for admission to the host university. There is no priority consideration for admission of such students in their admissions process. Outgoing exchange students must pay the tuition fee to SNU and maintain their enrollment at SNU during the exchange period. Also, incoming exchange students from partner institutions must pay their tuition to their home university and maintain their enrollment. These are the conditions under which exchange students can enjoy tuition waiver from the partner institution. In most cases, exchange students have the same rights as regularly enrolled students including taking regular courses, access to school facilities and services. Exchange students must be proficient in the language that the host university’s courses are taught in. In some cases, partner universities do offer a separate program just for exchange students. If this is the case, please note that there may be limitations to the range of courses that exchange students can take. 2How do I prepare for the exchange program? Every semester, SNU opens exchange programs in two different areas. It is advised that you begin your preparation well in advance of your intended exchange period. You must have with you, a language exam score that was obtained within two years of the start date of the exchange period. And, the most important thing is to choose the host university. While not all applicants will be admitted to the university of their first choice, students are encouraged to look up information about the partner universities and available courses. Students can visit the websites of our partner universities or Office of International Affairs (Bldg. 152) to acquire more information. 3When are exchange student selected? And when is the exchange period? The exchange students selection process takes once per semester. The process is divided into two tracks that are grouped according to regions: one is Asia, the Americas, Oceania; the other is Europe. Please be advised to follow the announcements closely. 4I am an international student/overseas Koreans currently enrolled at SNU. Am I eligible to apply? Yes, international students and overseas Koreans currently enrolled at SNU are also eligible to apply to the exchange program. 5What kind of contents must be included in the statement of purpose? You need to submit the statement of purpose both in the language spoken in the host university and in Korean. However, if you apply to a university where the main language is English, then you do not need to submit the same statement of purpose written in Korean. Formatting is up to you. There is no set standard format for the statement of purpose. You may include why you want to study at the partner institution, what kind of major or courses offered you are interested in, what specific type of experiences or activities you want to go through. The statement should not exceed more than 2 pages (A-4 size paper). Please be advised to invest sufficient time to prepare your statement as the SNU OIA and the host universities will closely review the statement in the student selection process. 6How likely is it that I will be admitted to the School of my choice? You can apply up to a maximum of three partner universities. However, please be advised that it is possible that you may not be admitted to the school of your choice. The exchange student selection process is quite competitive due to the high number of applicants. Further, some partner universities may attract more applicants. 7How Competitive is the Selection Process? We cannot provide the exact figure that illustrates the competition rate because the number of available spots for exchange students and applicants vary every year. We find that the applicants’ preferences regarding the areas or the partner universities vary each year as well. Nevertheless, the number of applicants continue to rise and thus the selection process is becoming more competitive. Please prepare well in advance. 8Is it possible to be rejected after the final examination of the host university? After selecting exchange students, the SNU sends application letters to the host universities. Then the host universities make the final decisions. Most of the students who are recommended by SNU are admitted unless there is a special cause for disqualification. 9Is there minimum credit criterion that I must meet at the host university? Also, will the credits earned abroad be transferred to my transcript? Please note that depending on the host university, the minimum number of credits required may be higher than noted above. If you are selected as an exchange student, you must submit a course registration form to your department three months before the exchange semester begins, in order to arrange for the credit transfer. Please be advised that you are responsible for checking and consulting the administration officers at your department office, the issues related to credit transfer, etc. Credit transfer is determined upon sufficient consultation with the department advisor or the department head, based upon SNU’s relevant statutes. When you complete your exchange semester and return to SNU, you must immediately submit the transcript to your department. You must also submit a copy of the transcript to the Office of International Affairs. 10How will the credits be transferred if the evaluation systems of host universities differ from that of the SNU? The course grades will be registered into your academic record, as printed on your transcript from the host university. However, when GPA is calculated, only the number of credits will be included. The grade itself will not be added to your total GPA score. 11Can exchange students live in the host university dormitory? In most cases, once the host university finalizes the exchange student selection process, the student will apply for dormitory housing at the host universities as well. In most cases, students will be assigned dormitory housing. 12What are some of the costs that the exchange students may have to pay out of pocket? Exchange students do not pay tuition at their host universities. However, other expenses such as airfare and everyday living costs will be paid on their own. Applicants will have to consider how they will pay for such costs during their stay abroad. 13Are there any scholarships that support personal expenses? You can find the information on scholarships on our website. (oia.snu.ac.kr → outbound program → exchange program → scholarships) You can also apply for other scholarships depending on the country where the host university is located in: for example, the DUO Korea Fellowship (27 host universities in ASEM membership countries), TF-LEaRN (Singapore University for Fall semester only), JASSO (Japan), etc. Please visit the websites for more detail.